Below is a sample discovery board, followed by a description of each column. Newly identified user stories and other backlog items. Also user stories that are undergoing further research, identified by a dot on the card. When the research is done, an X is marked through the dot. User stories that are ready to be estimated. The team has identified a few clarifying acceptance criteria for the story. Serves as the agenda for the weekly sizing discussion. 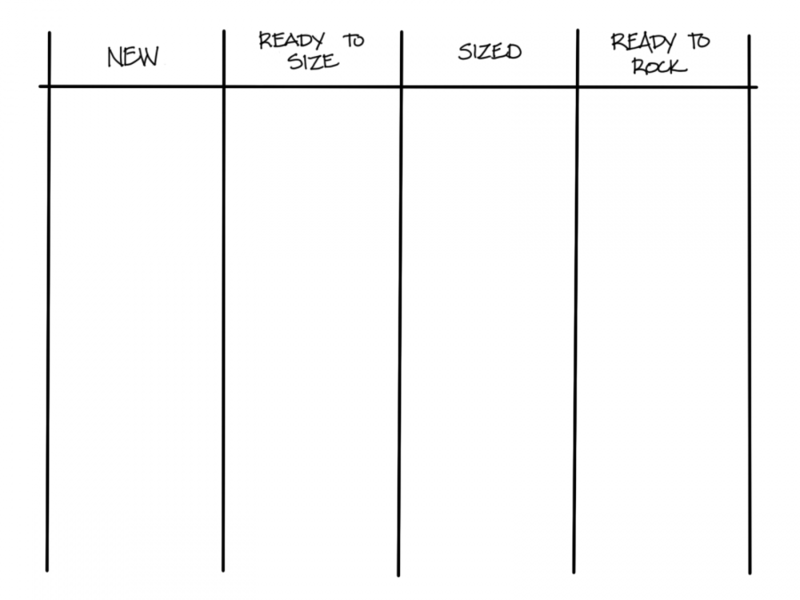 User stories that form the queue of stories that need examples, a wireframe, and the rest of the information needed to meet the definition of ready. User stories in this column are also potential candidates for three amigos sessions. User stories that are ready for delivery and can be considered for iteration planning. Discovery boards are most useful in situations where a team is following an iterative approach, such as Scrum, and are working in a sufficiently complicated environment. In this situation, teams will find it helpful to perform analysis and dive into the details of user stories prior to the iteration in which the stories are delivered. The discovery board brings visibility to the state of a team’s backlog and shows how many backlog items are ready for the next iteration. The discovery board also provides team members with an idea of which product backlog items will be discussed during their estimating sessions and which stories will be fleshed out next. This helps teams hold much more effective iteration planning sessions. The discovery board also provides a visual aid when talking to stakeholders about difficulties the team may be having with their backlog, such as too many backlog items coming in with insufficient information or not enough valuable stories to work on. Gather the team together and discuss whether it would be helpful to visualize the backlog refinement process. If so, continue. Discuss the steps in the team’s backlog refinement process. Determining which steps warrant a separate column is a little subjective, but there are some guidelines. If the different steps can be done by different people, or if discussions requiring some preparation occur at certain points, those may be good column candidates. Knowing whether every backlog item goes through the step can also guide the team. Determine policies for each column. You can also think of these as entry criteria: What things need to be in place in order to have a backlog item in that column? Determine if any buffer columns are needed between the process steps. These are especially helpful if the team finds value in knowing which backlog items are actively being worked on versus which ones are just waiting for the next process step. Decide what information the team wants to display on the cards or sticky notes they use to track product backlog items, and create a card for each backlog item that is currently in process. Place the in-process backlog items in the appropriate column. Determine what tokens the team wants to use to stand in for things not indicated by the columns on the board, such as blocked backlog items or backlog items needing research. Once the team has created their discovery board, they should use it as an ongoing reference point for the status of product backlog items in backlog refinement (the discovery process). Depending on what columns are on the board, certain columns can be used as agendas for team events such as sizing discussions and can even provide an indication of whether a sizing discussion is needed at all (e.g., if there are no stories ready to be sized). The discovery board can also serve as a to-do list for people who are focusing on the discovery process to determine which backlog items they need to get ready next. It also provides a clue to other team members that they need to help out to make sure the team has enough backlog items ready for the next iteration planning. It is often helpful to have a member of the team accept the responsibility to focus on moving backlog items across the board and having the discussions with team members and stakeholders necessary to get the right backlog items (i.e., the ones that produce the most value when completed) ready for the next iteration. Finally, it’s very helpful to have the discovery board and the delivery board (discussed later in this chapter) next to each other so the team can do their daily coordination discussions (standups) at the boards. This focuses their discussions on items in play on either the discovery board or the delivery board instead of having people say what they did, what they are doing, and what obstacles are in their way. Don’t let the discovery board lead you to believe that all discovery happens while the team is getting backlog items ready. A great deal of discovery happens at this point, but some discovery will still happen as stories are developed and tested (when backlog items are tracked on the delivery board). Each team’s columns may be different. The format and layout of each board are based on how that team approaches backlog refinement. Backlog items progress across the board from left to right. Within each column, the position of the backlog item represents its priority, with backlog items that should be dealt with first appearing at the top of that column. The discovery board is roughly based on the idea of a Kanban board, where items continuously flow across the board as they are being readied for iteration planning, unlike a delivery board, which is effectively cleared off at the end of each iteration and reset. In most of the cases where I have seen teams use discovery boards, they did not implement work in process (WIP) limits. That’s not to say that at some point they wouldn’t do so, especially if they found that work was not progressing through backlog refinement smoothly enough. But for those teams, using the target of having a sufficient number of backlog items ready for the next iteration planning seemed to be a sufficient regulator for items on the board. The discovery board is most effective when it is an actual physical board where items are tracked by the team. People tend to be more likely to glance at the wall to get a quick check of status than to make an explicit effort to go to a tool and look at the status of items there. The physical board also aids with daily coordination discussions as people can physically move cards and point to them when they are discussing a particular item. Physical boards are great for displaying status but are not as useful when the team is virtual, or the team needs to maintain detailed information about their product backlog items. An approach that works well for these teams is to have both the physical board and an electronic repository. The physical board is considered the source of record for status of the backlog item, and the electronic repository is the source of record for details about the product backlog item. If the board and the electronic repository differ, the board is trusted. Of course, when discrepancies are noted, the team should resync the two sources. Many agile tracking tools can graphically represent boards, and teams have found it helpful to replicate a view of both the discovery board and the delivery board for remote team members. If you learn better with video rather than reading, you may want to check out Analysis Techniques for Product Owners Live Lessons, a set of video training sessions that show you how to apply analysis techniques to product ownership. Lesson 6.1 focuses on the discovery board.